It is big, and pink and bold and probably the largest ‘Seismic’ that I have seen from Jee See (Goshiku Chavu). This simple but impactful piece is on one of my favourite walls in Bristol in Dean Lane skate park. Jee See already knows that I am a big fan of his work and his relentless pursuit to find walls to leave his work and messages. He is always pushing the boundaries with his themed work and also on his Instagram feed which hosts so many photoshopped images and sketches. Seismic! Another archive piece, this time by the lovely Jee See in The Bearpit featuring his ‘seismic’ writing and a character with jagged stripe under the eye. I love the words Brizz Graff making an appearance – a love for the City and for graffiti. Like minds. I met Jee See last week and although I had met him once before it was really nice to consolidate the friendship. He is a real gentleman and interesting guy. I am working on persuading him to take me out spraying some time (when I have practised a bit) – I know he reads my posts, so there is no escaping me. Loads more of his work in archive. Many of you will now that I am a big fan of the work of Jee See (Goshiku Chavu) and have featured his work many times on this blog. It is not only his raw and passionate artwork that I like but the honesty and integrity of the artist himself, and the rich life experiences he has had. His journey into street art has been an interesting one and it is probably all the better for it. For Upfest Jee See produced this rather haunting piece ‘escape airstrip one – 1984 is not fiction’ – a politically charged piece. I have just noticed a rather annoying balloon string hanging right across the photograph, obscuring it a little. Grrr. At the base of the hooded character Jee See offers his trademark ‘seismic’ tag, always a winner in my book. My only regret about this piece is that by the time I got to it, he had left North Street Green and I didn’t get a chance to hook up with him. Maybe another time. 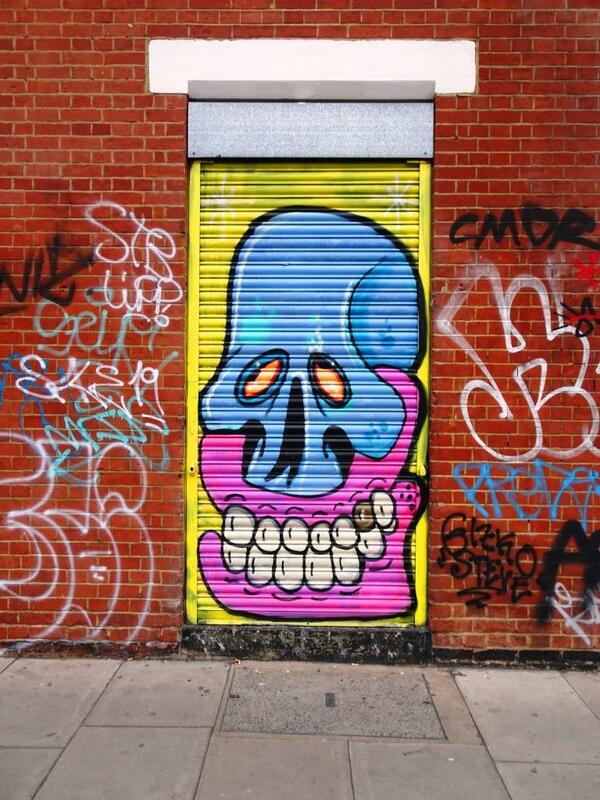 An eye-catching piece in Dean Lane by Jee See (G.C. – Goshiku Chavu). On a black background, he has worked this neon green seismic piece really well. It reminds me of early green screen computers and video games like Space Invaders. Jee See is another of those Bristol street artists who consistently turns out great work and furthermore he sprays in spots all around the city. Some artists prefer to stick to their own patch. More to come from Jee See soon. The unmistakable seismic tag of Jee See. This is just a quick one in Dean Lane skate park. I am interested in this tag, because he uses different 3d skadows for divverent letters, so the SEI shadow downwards, the SMI shadow to the right and the C shadows upwards, which makes for an interesting perspective. Helpful to me to in learning how to work these shadows. I understand the Jee See used to be a teacher, so there is really nothing to stop me picking up a can and getting busy. I get inspiration from artists like Jee See who find spots around the city and practice their work. It is interesting how much a wall can change in a short space of time. In the last month, this wall has changed at least four times. This incarnation was a practice run by Jee See, whose Instagram handle is Goshiku Chavu (G C…get it?) which means ‘thank you’ in Japanese…I think) for a piece that he created here a day or two later (and which I have missed I think). In this piece he has painted probably the lagrest ‘Seismic’ I have seen from him. Now, I’m not too sure what the Top Cat thing is all about, but I love him to bits. I don’t think that Jee See created him, it just isn’t his style, and it isn’t clear which was here first. I don’t even know who the TC is by, there is no signature and there are several artists in Bristol capable of creating cartoon characters of this quality. The whole thing is rather nice, a little bit weird and now utterly gone. This is a really terrible picture of a quickie from Decay on the left and trademark ‘SEISMIC’ from Jee See on the right. It is always geat to see work from both of these two artists, whose work is stylistically quite different. I am really enjoying these small character type pieced from Decay at the moment. This board in The Bearpit has since been prepped and replaced with new work sprayed during a paint jam on 14 April 2018 – more on this to follow.